Farmers have realized that drainage and agriculture are really inseparable. The high cost of agricultural inputs and machinery require the farmer to reduce the risk of crop loss. Drainage eliminates one of the risks. Many farmers consider drainage to be the best management practice. Farmers are being asked to provide more and more of the world's food and fiber at a lower cost. This type of demand makes drainage even more important. 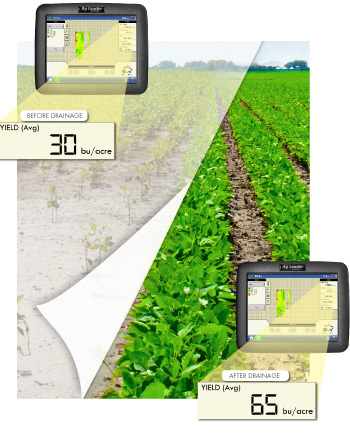 GPS yield monitors continue to show significant differences in drained and un-drained ground. A systematic drainage system may increase yields as much as 50% in some cases. Farmers are also finding that tile not only helps in wet years, but also in times of drought. The tile system lowers the water table in the spring, which promotes a deep and vigorous root growth. Water table management is also now being incorporated into the drainage systems. Farmers may be able to bring the water table up closer to the root system to hold water in the system for later use. There also may be certain tax advantages that can be used on a drainage system. The return on investment of a drainage system can be much greater than buying more land. Land values are increased with drainage systems. Drainage is truly an ally of the farmers conservation plan. The reduction in surface runoff in turn reduces sediment and fertilizer infiltration to streams and ponds. Systems focused on removing excess water from the root zone. Systems focused on removing excess water from the surface.